Most folks (esp. those with kids) will use the Talapus Lake Trailhead to reach Talapus and Olallie lakes, since its only few miles and 800 feet elevation gain, as mentioned on page 194 in this book. 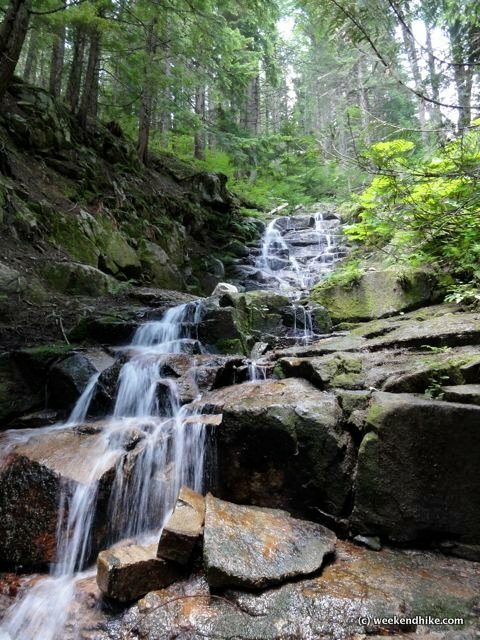 The hike below is a HARDER route and provides a "off the beaten path" hike. The downside is there isnt much to see along the way - except for some strong creeks and waterfalls. There are no huge open vistas (except for one, which requires a mile-long sidetrip and an addtional 500 foot elevation gain). If you want huge views, check out Granite Mountain or nearby Bandera Mountain and Annette Lake. 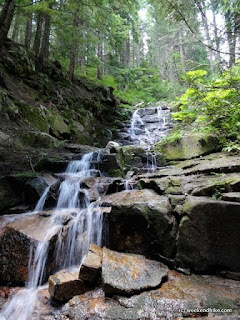 By no means is this a disappointing hike -- its well shaded for hot summer days, easily accessible from I-90, has a cool waterfall, and pays off with a nice Alpine Lake. Its basically a "nice" solid hike. 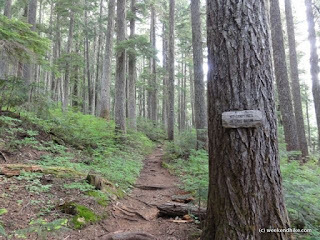 This hike starts from the Pratt Lake Trailhead. The medium sized parking lot can fill up fast on weekends as most folks use this trailhead to do the Granite Mountain hike. 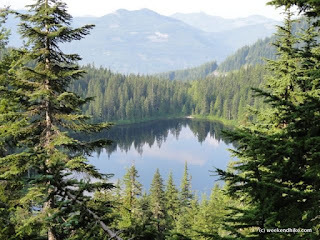 Additionally, a large sign points out at least 10 different destinations from this point including Pratt Lake, Island Lake, Melakwa Lake and other popular destinations. 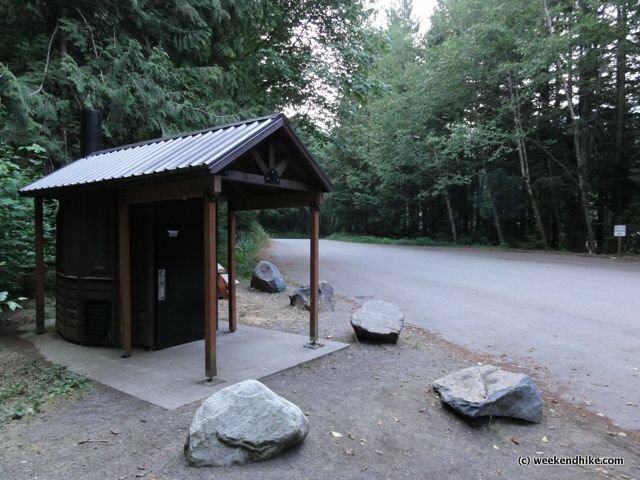 There is a pit toilet but no running water at the trailhead -- so be prepared to pack liquids for your journey. 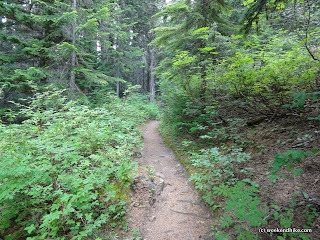 The trail is well packed and well maintained, there are few intersections so its easy to find your way up the mountain. 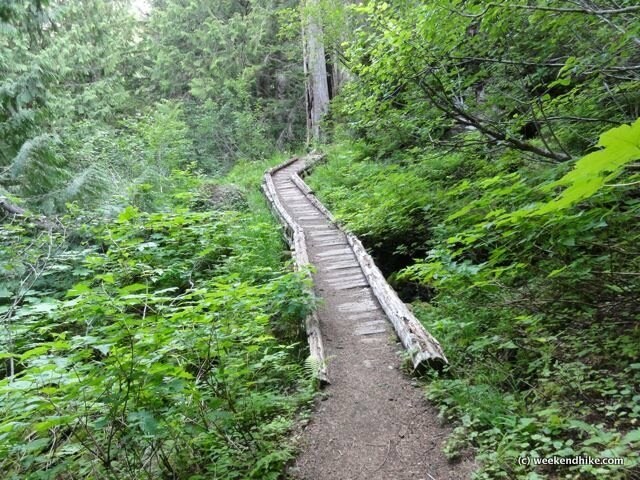 This hike is almost all (99.9%) in the shade, so its a good choice on hot sunny days. The downside is there are very few viewpoints. As mentioned, if you want to look at the mountain views around you I would look else where -- Bandera or Melakwa offer great Vista viewpoints. 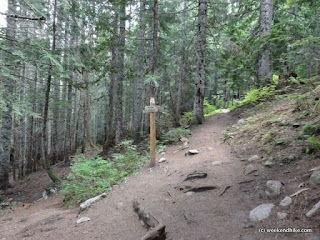 At 0.6 miles (and 2500 feet elevation), you reach the intersection with Granite Mountain trail (FS Trail 1016). This is a popular hike and most folks will turn here to make the journey up to the 5,629 foot summit of Granite Mountain. 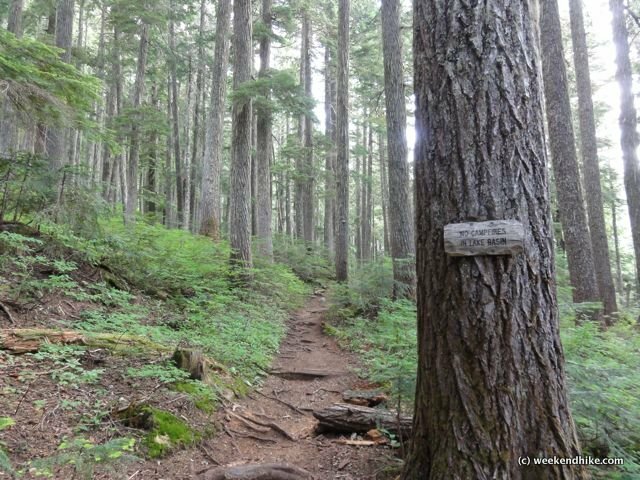 Continue forward on the Pratt Lake trail. 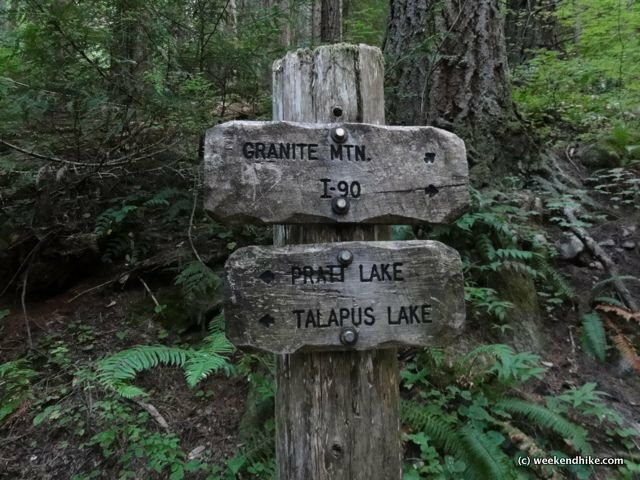 While not a very popular route to reach the Talapus or Olallie Lakes, this way offers some nice creeks and waterfalls along the hike. 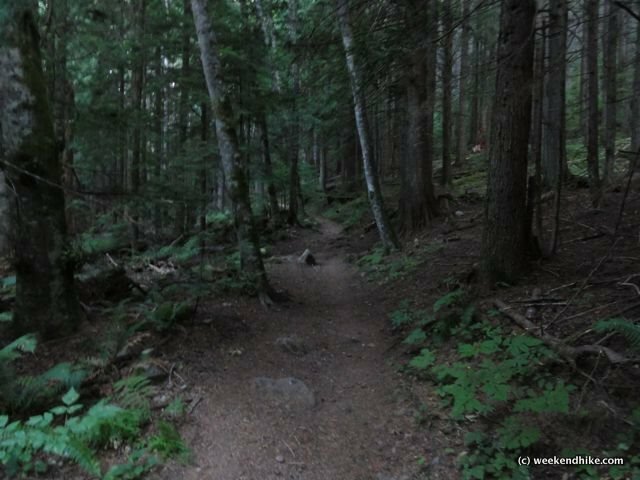 Plus this route is much steeper (compared to starting from the Talapus Lake Trailhead), so you will encounter less casual hikers. At 1.5 miles you reach a very nice step-rock waterfall. 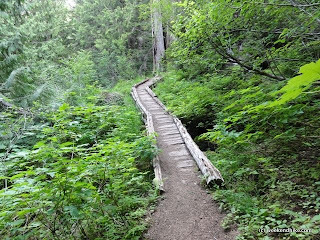 Further up and around Granite Mountain you will encounter an fairly extensive boardwalk section which is in decent shape and keeps your boots dry from the streams feeding Talapus Creek down below. 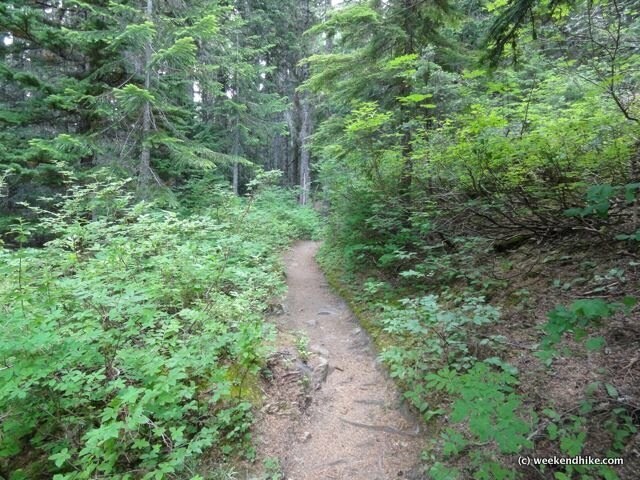 After a short jog downhill and creek crossing, you will run into the Olallie Lake trail -- turn to the right. Before you know it, you will reach a large open area at the Lake. The morning I was there it was THICK with Mosquitoes, almost so thick you could chew on them -- but the sun was still not over the surrounding mountains yet, so it was prime time for bugs, and the jumping fish in the lake! The lake offers a number of spots to stop and enjoy the water and scenery. To return back to the trailhead, simply head back the way you came to the Lake Pratt Trailhead as mentioned in this book on page 216. On this morning, I wanted to view the lake from higher up on the Pratt Lake Trail (and away from the bugs). 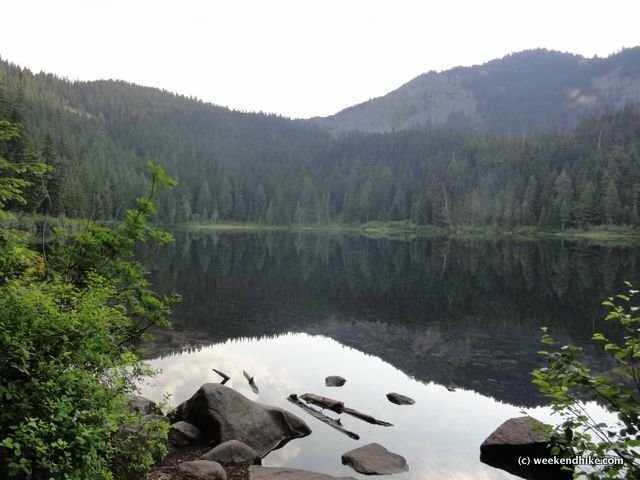 Upon reaching the Pratt Lake Trail, simply turn LEFT to head higher around the lake to a nice view point looking south. After a mile of an uphill climb you will reach an open rockslide view point for the lake below. This has the best views on the hike (like I mentioned, this is NOT the hike for seeing vistas). 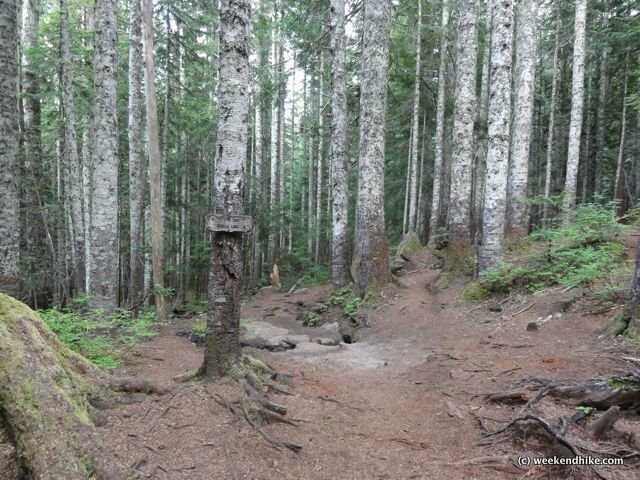 Some hikers will continue past this viewpoint to reach the intersection with the Mount Defiance Trail (FS trail 1009) which leads to Island Lake, Rainbow Lake, and of course Mount Defiance. 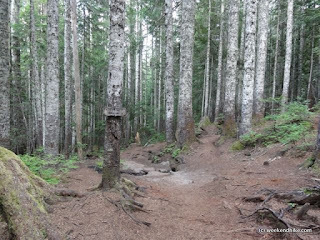 The Pratt Lake trail heads downhill at that intersection to reach Pratt Lake in 1.8 more miles. As for me, I was running low on water and decided a nice 8 mile hike was enough so I headed back to the trailhead from this viewpoint. The total trip took about 4.5 hours -- including the sidetrip up to the viewpoint. Trail - Out and back dirt trail, narrow in parts. Almost all in the shade. Getting There - From Seattle, take I-90 east to exit 47. Turn left and cross over the freeway. Turn Left on the Forest Road toward Pratt Lake traihead. 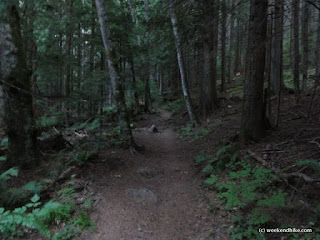 Other Trails - A couple connecting to other Alpine Lakes Wilderness destinations, plus Granite Mountain hike.